Cal Poly Pomona President Soraya M. Coley was recognized for her leadership in higher education in a ceremony at the California Senate on April 2. 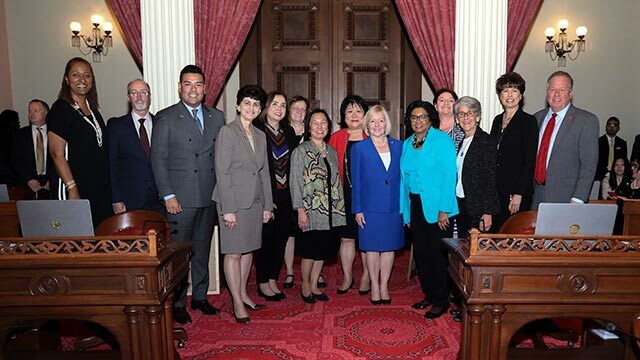 In commemoration of Women’s History Month, Senator Ricardo Lara (D-33) honored all 13 female presidents of the California State University system. The auspicious group of female leaders includes: President Coley, Erika D. Beck at CSU Channel Islands, Jane C. Conoley at CSU Long Beach, Dianne F. Harrison at CSUN, Karen S. Haynes at CSU San Marcos, Gayle E. Hutchinson at CSU Chico, Ellen N. Junn at Stanislaus State, Mary Papazian at San José State, Lisa Rossbacher at Humboldt State, Judy K. Sakaki at Sonoma State, Sally F. Roush at San Diego State, Adela de la Torre at San Diego State (June 2018) and Lynette Zelezny at CSU Bakersfield (June 2018). Coley became the sixth president of Cal Poly Pomona in January 2015. A veteran administrator with more than 20 years of experience in higher education, she came to campus from CSU Bakersfield where she was provost and vice president for academic affairs from 2005 to 2014. Her full biography is available on the President’s Office website.